Their cage isn't just a place for your two ferrets to eat and sleep -- it's their home, and they deserve to feel at home in it. Specific features make a cage appropriate and comfortable for ferrets, while some cage features and designs aren't appropriate for them. Choosing the best cage for your two ferrets isn't only for their safety and comfort, though; it also facilitates your daily and weekly care measures. Ferrets are renowned escape artists, so a secure cage keeps them in place when they aren't out in a ferret-proofed area with supervision. Because they're so social, your two ferrets will play together in their cage, so they need one with enough space and a safe setup. Ferrets are a bit fastidious, too; they don't like for their dining, sleeping, litter and play areas to be right on top of each other. They are burrowing animals by nature, so also require enough depth to dig down. Ferrets confined to a cage too long or to one that's too small or otherwise not well-suited to their needs develop behavioral problems and may engage in excessive chewing or other self-destructive behaviors. There's no single cage brand or style that's definitively the best for your two ferrets. Purchase a cage that's specifically designed for ferrets. Other types of cages just don't cut it for a variety of reasons. For example, hamster and gerbil cages are too small, glass aquariums don't provide nearly enough ventilation and bird cages don't have the right setup. Choose the largest, sturdiest ferret cage you can afford. 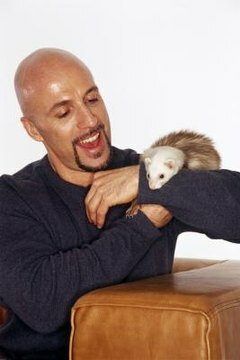 Know going in that quality ferret cages can cost several hundred dollars. Often, better deals can be found online, but buy only from a reputable site since you won't be able to inspect the cage prior to purchase. Ferrets are active, requiring a good deal of space, particularly if they don't spend most of their waking hours out of their cage. At minimum, a cage for a pair of ferrets should be 20 inches long, 20 inches deep and 40 inches wide, but the bigger the better. Multi-tiered cages are preferred, but ferrets can get injured falling, especially during play; hang ferret hammocks near upper level edges. Wire bar cages are best, but floors should be solid to prevent discomfort or injury to your ferrets' feet. Wire floors can be covered with linoleum, but not with foam or rubber -- ferrets eat those materials and can develop intestinal obstructions -- and not with wood, which absorbs odors too well and is difficult to disinfect. Linoleum is also easy to clean. To make cleaning easier, select a ferret cage with removable flooring, upper level shelves and other components. Don't underestimate a ferret's ability to open a cage door; confirm that the cage you're considering has a proper ferret-proof latch. Also, the wire bars shouldn't be spaced any further apart than an inch to prevent your pets from squeezing out. Check the cage over carefully for exposed wire ends, sharp shelf corners and other potential hazards on which your ferrets can get hurt while running and playing together.